Within Temptation are premiering their new video for The Reckoning exclusively with Metal Hammer. The Reckoning is the first single to come from the band's upcoming seventh album Resist. "We’re super excited to finally share with you the music video of The Reckoning," vocalist Sharon Den Adel tells Hammer. "We know the wait was long, but we are extremely psyched to share our new music with you and we truly hope you enjoy it as much as we do!" The video comes almost two weeks after Metal Hammer exclusively announced that new album Resist would be released on December 14 via Spinefarm Records. 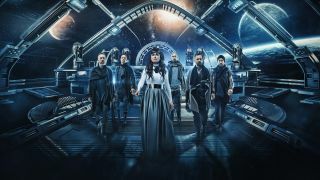 Speaking about the album, Sharon said that today's pop music "lacks a rebellious edge" and it's Within Temptation's goal to "roughen the whole thing up as much as we could, allowing us to shape a new musical world that is heavier, dirtier and more futuristic than we’ve ever created before. Within Temptation are on the cover of the new issue of Metal Hammer in a world exclusive interview, giving the full story behind the struggle and turmoil behind the new album. Order your issue now.